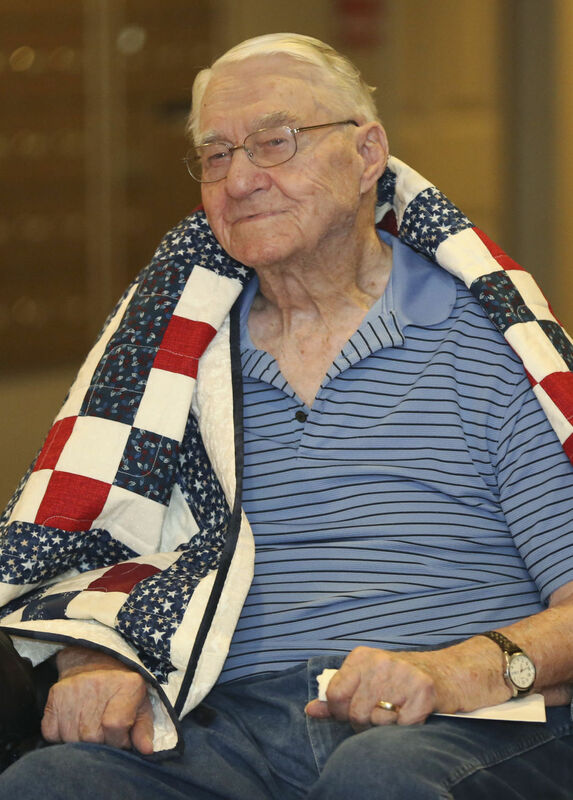 Local quilters honored nine World War II veterans with Quilts of Valor on Wednesday for Pearl Harbor Day. Red, white and blue colors adorned the quilts to fit the patriotic theme. The Hastings Quilters Guild presented the hand-crafted quilts to nine residents at The Heritage at College View. Recipients were Army veterans Jim Hawes, Clyde Hoagland, Sarah Jepsen, Bob Karmazin and Burdette Schultz, as well as Navy veterans Eldon Bassett, Les Dougherty, Jack Friend and Kenny Heuertz. Sue Brown, a member of the Hastings Quilters Guild and co-chairwoman of the community service group, said the quilts range in size from 60 by 72 inches to 80 by 108 inches. Instead of being a decoration, she said the quilts are designed to be handled. The recipients appreciated the keepsakes and their usefulness. Hoagland, formerly of Glenvil, described the quilt as beautiful. Hoagland served in the Army for about two years, being stationed in Tokyo for part of that time. Becky Bruns, life enrichment director at The Heritage at College View, said 13 of about 60 residents at the facility are veterans. She said some were hesitant to participate in the presentation because it’s so humbling for them. Bruns said they often feel they were just doing their part and don’t deserve any special recognition. “They are so humble,” she said. Bruns’ father, grandfather and great-grandfather were all veterans, making patriotic celebrations more special for her. She said College View prides itself on having regular events to show appreciation to veterans. Brown said they worked with the facility and decided Pearl Harbor Day would be the perfect day to make the presentation. She said her father served in World War II. The Hastings Quilters Guild is preparing to make another 20 quilts for other veterans in Adams County. Brown said they are looking for volunteers to help sew them and bind them. Each quilt takes about $95 in materials so any fabric donations would be appreciated. The group meets the third Saturday of each month (except December) at Calico Cottage, 734 W. Second St.
“Anybody is welcome to come and sew with us,” Brown said. To read the full article in the Hastings Tribune, click here.